Old City Hall in Eugene, Oregon was only built in 1964 but is now being demolished. Not long after it was built, important systems like heating began to fail and it quickly became the bain of existence for those working in those public offices: no one could ever get warm and there was no way to jury-rig the heating system in the poured concrete walls. Through out the City Hall complex was quality public art from renown local artists like Andrew Vincent, 80 something year old, past WPA muralist and chairman of the art dept at local University of Oregon. The process of saving Mr. Vincent’s mural from demolition along with the Old City Hall was accomplished by Scott M. Haskins and Fine Art Conservation Laboratories (FACL, Inc.) under the direction of McKenzie Commercial, General Contractor. A serious complication made this mural removal a little different from the many other similar projects we have accomplished over the last 40 years to wide fan fair: the discovery of asbestos in the plaster in the wall behind the mural. So, here are a couple of videos to give you the inside information. First, a quick video of the general mural removal process and Second, a testimonial about the asbestos abatement process and the specialized training that was required. http://www.FineArtConservationLab.com Click here for video tour of lab. Your mural removal article is really interesting! Cynthia, I’m glad you found your way to this blog post and left your comment!! Given your father’s WPA mural work and style of painting I thought this 1960’s style was very interesting. Its so 1960s!!! (BTW, I really liked his WPA work too) The removal process was safe for the painting and I am anxious to be part of this process of reinstalling the mural into the new city hall and being part of this important public art preservation project. Diane, thanks for leaving a comment. It was a privilege to be entrusted with the mural’s safety. 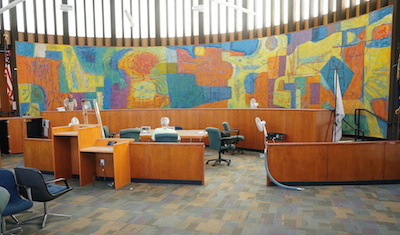 The saving of the mural from demolition was an important task for everyone on the City Hall Project. Pass the word along to the family that your grandfather’s work is held in high regard. As Andrew Vincent’s granddaughter, – thank you so very much for caring this much. Warms my heart to the very core! This mural and many others are incredibly important to the whole family, and all his students. Bravo bravo! !